Find the right tour for you through Kea. We've got 12 tours going to Kea, starting from just 5 days in length, and the longest tour is 15 days. The most popular month to go is May, which has the most number of tour departures. "Amazing trip - whether you've visited Greece before or it's your first trip this..."
"Was a little nervous before the trip because once on board there is no ready exit..."
"I travelled solo on the guided Greek Islands Bike & Boat. 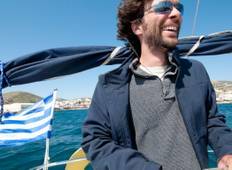 I booked as twinshare and..."
"Sailing the Greek Islands was wonderful. The small group (we had 8) experience was..."
"Incredible trip. Skipper was fantastic, knowledgeable, and looked after our every..."
"Mixed experience. Booked through Utracks, which has contract with a German company..."